I have two 40 liter bags, one for the front and one for my back, I guesstimate they max out at about 80 pounds when loaded properly. Yesterday, I purchased rice, almost salt, and a few cans of vegetables. In India I purchased a new 220 Electric Hot Plate. I found two one pint or 500 milliliter bottle of alcohol for fuel. This stuff weighs a lot. The weight is not a problem, the moto taxis or a car taxi cost between 40 cents US and 4 dollars on average to get from any hotel to any inter-city collective taxi departure point. It is the volume or space needed in the backpacks that is a problem. I was not able to finish the expandable part of my backpack, because of incompetence on the part of the Nepal backpack makers, therefore I missing a critical part of my back. I need an extra 20-40 liters of storage compartments now and again, not always, yet, I do need it sometimes. The can goods, the heater, the rice, for sure the 2 bottles of alcohol take up too much space for an airplane trip and would be jettisoned before I fly anywhere. I forgot, I also want to carry another 4-8 books, aaagh, there is a real need for volume. I am trying to muse, dwell, obsess on this issue before I move out of Lome, Togo, I need a solution or I am going to be like ever other dingaling backpackers, and be carrying gear in plastic bags. I do not tie things on the outside of the bag, I do not carry plastic bags along with my backpacks. I can and am capable of tying items to the bags, both bags are made exactly for this, however I am really wanting everything all the gear inside the bags. I think I need to have a special 20 liter bag made that will become a cap or part of my bag, this is annoying, every time I think of this I get angry at the Nepal bag makers, knowing they were just slow in the head, and very under-developed emotionally to handle the project. They could copy anything, yet to create became impossibly long, this is the under-developed aspect of under-developed, right along with the lack of develop manners and caring. I just realized, I am in Lome, a city, it would be better to go to a smaller village and do this than to stay in Lome and try to get city people to care. Village people are much more culturally able to care for something than a city person who by nature of a city become jaded, money hungry, not nurturing because of the socialization of cities. I have a bag of sorts, a pillow of sorts, I will fasten it on the outside of the bag, it is extremely safe and compact, just not the ideal way to carry items, however better than 99 percent of the other backpackers idea of a good idea. I do not like to lose items, I do not like when I accidentally set something down and walk away and lose the item. I have both a mosquito net and a rain poncho, the rain poncho pretends it is a rock, the number one worst item in my bag probably for weight. I use this poncho and mosquito net about almost never, but when I need them, I need them. I mentioned the mosquito net rule, of things you need to carry, because on the one night per year when you need them, you would do about anything to have them. Ok, he is on a motorcycle, there is a perceived idea that these persons would be camping along side roads and such, GONG, not so true. I have been thinking, what is unusual about Africa is to take public transportation across Africa, it almost makes me think a motorcycle, van or truck of some sorts would be the easy way. It is more unique to take public transport than to drive in Africa. Here is a photo of a SUV or 4-wheel drive overland trips. 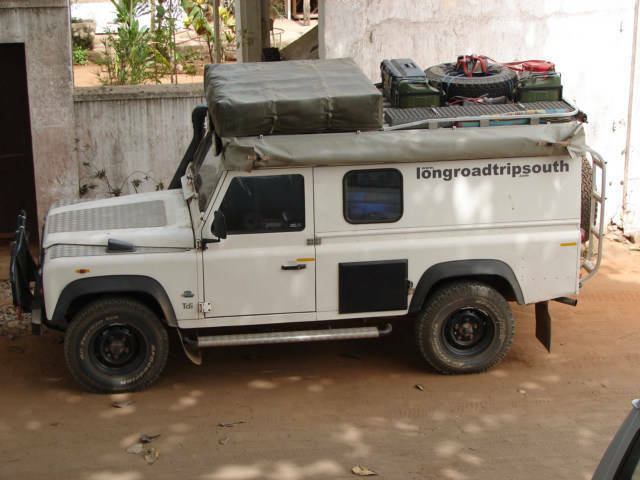 This vehicles was parked in front of the Galien Hotel in Lome, Togo for a short time, not sure why? However, I would say this is about the most prepared for bear vehicle I have seen. I hope they have a winch on the front or back somewhere? I cannot see one in the photo. Theft and getting stuck, man this seems like a great truck to rob, it is pretty obvious they probably have money. I think about a van, but I want about a 100-200 foot cable winch so I can get unstuck about anywhere. I am in a quandary, the vehicle owners here have for sure worked very hard to be prepared. However, if they was extremely prepared in my view, I would never have noticed the truck, thinking, just another Junker on the road. I noticed, therefore from a safety point of view a little over the edge. The difficult part about going across Africa seems to the Chad, Congo, Angola area of questionable safety.